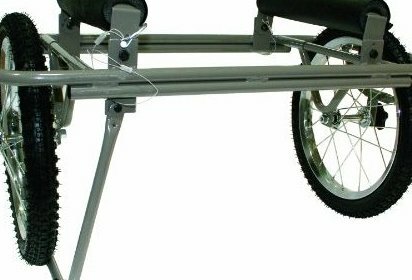 ATC Cart designed to haul kayaks, canoes, John boats, and larger craft. Rugged 16-inch bike tires goes easily over rutted paths and quickly on flat, paved surfaces. Heavy-duty power-coated steel frame breaks down for easy storage and transport. Spring-loaded, super stable kickstand. Hauls up to 300 pounds; 19 by 33 inches (H x W).